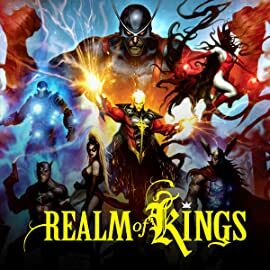 Collects Realm Of Kings, Realm Of Kings: Inhumans #1-5, Realm Of Kings: Imperial Guard #1-5, Realm Of Kings: Son Of Hulk #1-4. 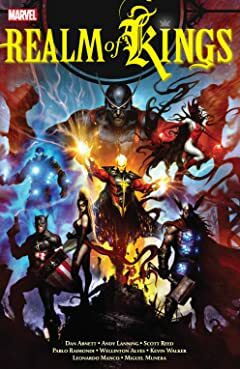 The War of Kings leads to new adventures for the Inhumans, the Imperial Guard, the Son of Hulk and Quasar! 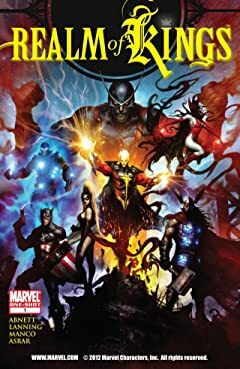 In the final confrontati on of the War of Kings, the wicked Vulcan and the Inhumans' Black Bolt both disappeared in a violent explosion. And though that epic conflagration brought sudden order to the Shi'ar and Kree galaxies, it also ripped open a wound in the stars a galaxy wide. 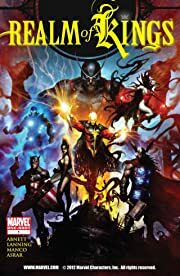 Now, the power players in the new order - Medusa and the Inhumans royal family, Gladiator and the Imperial Guard, and Hiro-Kala, the son of the Hulk - must face the threat of a dangerous realm known as The Fault in their own unique ways...or die trying!